What if you could have a dedicated set of compute resources for data exploration, another set of compute resources for Tableau Server users, and finally another set for ETL jobs—all while sharing the same data? This is one of the innovations in the Snowflake Elastic Data Warehouse, a new hosted data-warehouse solution from Snowflake Computing. It separates the data from the compute resources, called virtual warehouses, which execute data-processing tasks. 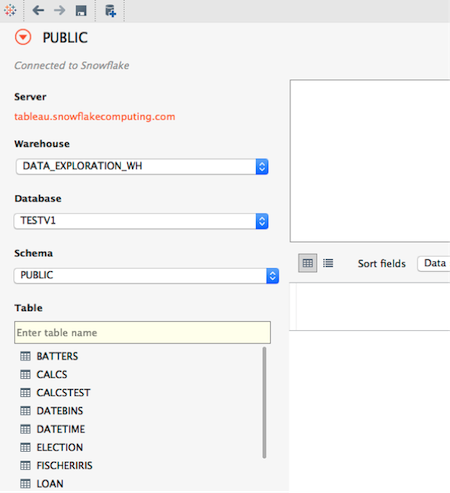 Now in Tableau 9.3, you can connect to your Snowflake Elastic Data Warehouse and pick which virtual warehouse you want to use. How can you use Snowflake’s virtual warehouses with Tableau? Say you work for an online gaming company that is streaming data into a Snowflake Elastic Data Warehouse and serving data to vizzes on Tableau Server. The marketing team asks you if the new in-app purchase campaign is more effective than prior campaigns. You have the tools to analyze the problem, but don’t want to affect ETL jobs or Tableau Server users. So you decide to create a new virtual warehouse dedicated to data exploration and call it “DATA_EXPLORATION_WH.” Using this new virtual warehouse, you can analyze the campaign data without affecting anyone else. Start your analysis by opening Tableau, selecting the new Snowflake connector, and filling out your connection details. Once connected, select your new warehouse “DATA_EXPLORATION_WH” and start analyzing your data. To switch warehouses, go back to the “data source” tab and change the warehouse to “TABLEAU_SERVER_WH” and click OK. Then publish your viz to Tableau Server so the marketing team can see your brilliant analysis! 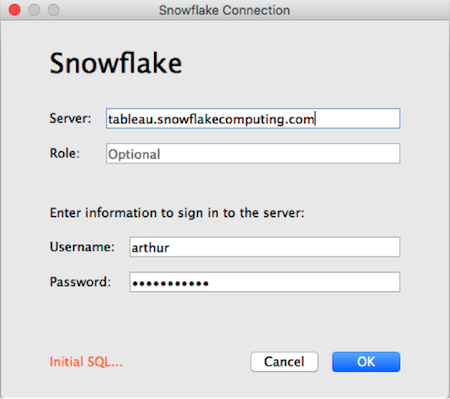 Download Tableau 9.3 and try the new Snowflake connector with your data.